A new Ford Explorer is for sale outside a Ford dealership in Moscow. The automaker plans cuts at two of its three Russian joint venture factories. MILAN, Italy -- Russia's falling ruble, shrinking car demand and threat of additional economic sanctions are hitting automakers such as Ford and General Motors' Opel division just as their European operations are recovering from a six-year slump. Russia's car market already was declining at the start of the year, making life difficult for foreign carmakers even before the government's annexation of Crimea dashed prospects for a ruble recovery. Ford reconfirmed its target of becoming profitable in Europe in 2015, a company spokesman told Automotive News Europe last week, despite cutting production and 950 jobs at two of its three joint venture factories in Russia. The cuts were announced on Wednesday, April 2. General Motors' decision to integrate its Russian business under the GM Europe umbrella as of Jan. 1, 2014, means that a market wobble in Russia will affect its European revenue. GM sells Opel, Chevrolet and Cadillac vehicles in Russia, where it had a 9.3 percent market share in 2013, according to the Association of European Businesses. Russia is GM's third-largest European market, the automaker has said. So far, GM and its European unit, Opel, have not announced production cuts. "Opel has trust in the Russian market and in further growth of the automotive sector. We are watching the political situation carefully," an Opel spokesman told Automotive News Europe in an e-mailed statement. The spokesman declined to comment on any financial effect from Russia on GM's targets in Europe, saying the company prefers not to speculate on financial matters. In Europe, GM wants to stop losing money by 2016, after losing more than $18 billion in the region since 1999. The largest U.S. automaker plans to spend $5.2 billion on its European turnaround effort through 2022. Chevrolet is the top-selling U.S. brand in Russia, but its sales slumped 15 percent in 2013 in an overall market that slid 5 percent. Among individual models, the Ford Focus was in seventh place last year, with sales falling 27 percent. Russian consumers are abandoning compact and mid-sized models in favor of low-cost cars or luxury SUVs. "The problem with Russia is that it's a polarized market," said Philippe Houchois, an analyst for UBS. "There's the high end and the low end, and not much in between." Foreign automakers have committed to invest $10 billion in Russia until 2020, enticed by tariff cuts, scrappage schemes and car-ownership levels well below eastern and western Europe -- and less than half the 740 vehicles per 1,000 inhabitants in the United States. Last year, well before the start of the Ukraine crisis, many forecasters saw Russia overtaking Germany as Europe's biggest car market in 2020. "All forecasts point out that Russia will become the biggest market in Europe in the next years," GM Europe President Karl-Thomas Neumann said in the October 2013 announcement that the automaker's Russia business would be integrated into GM Europe. But some forecasters now are stepping back from that scenario because political turmoil is seen feeding through to economic uncertainty and therefore depressing consumer confidence at least for this year and next. "We've always been a bit more pessimistic about the speed of growth in the Russian market," said Carlos Da Silva, IHS's manager for light-vehicle forecasts in Europe. Last month IHS cut its forecast for Russia, saying sales could fall 7 percent this year compared with a 3 percent decrease it had predicted before the Ukraine crisis accelerated. 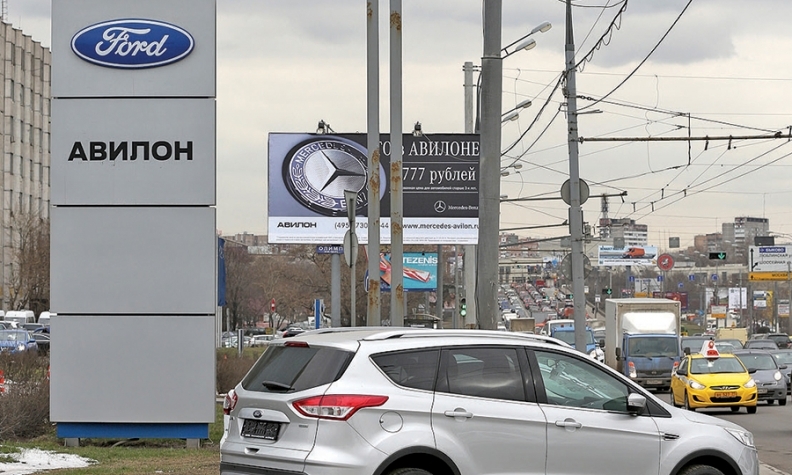 Ford said in its April 2 release that it still expects Russia to become Europe's largest market "in the longer term." Not everyone is running for the exits. Daimler said last week it has held discussions about building cars in Russia, where sales of the Mercedes-Benz brand rose 19 percent last year. The carmaker disclosed no time frame or names of potential partners, and said no decision is imminent. Fiat-Chrysler continues to look for a way to get established in the market, CEO Sergio Marchionne said on March 31. Fiat wants to build Jeeps in Russia, and it has been trying to gain a manufacturing foothold there since 2011 when its partnership with Sollers fell apart. Sollers and Ford are now partners. The turmoil in Russia has created some headwinds in Europe for battered mass-market carmakers, but probably not enough to seriously delay their recovery timetable. "It simply reduces the margin for error," said Houchois of UBS. "It's not enough to drag them down, but it means that they can't make mistakes elsewhere."